If there is another quilt block by the name Sweet Pea, I have been unable to find it. So, I made it up. 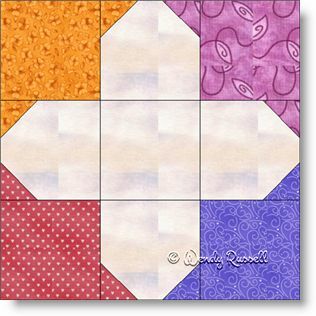 It is a simple block to make, but has many possibilities depending on how you set the blocks in your quilt. To add more interest to this nine patch block, you might choose to make the centre square in another fabric rather than the background fabric. This would add even more colour to your resultant block. I chose to make this a as a scrappy version, so that the final quilts would have lots of colour, just like any garden you would see. Here are just two sample quilts of what you could create with this very easy quilt block.